And, I have to say, except for the lack of hair on the monkey, this pretty much is a spitting image. The monkey is sporting my four favorite collectibles. All of which I am usually sporting every day as well. Digital calculator watch - check. 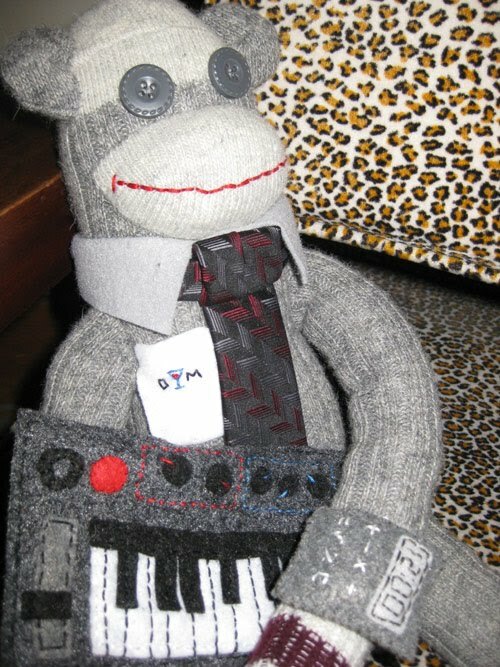 The synthesizer in the monkey's hands doesn't seem to be modeled after any specific synthesizer. But I kinda like the surreal-ness of it. And, I'm a big fan of pocket protectors. I wear one to work every day, and my collection has grown such that I can now wear one to work every day for over five months without repeats. But, I do have my favorites.